Over the next few months Flancake.co will be bringing you the finishing profiles of the Girl em[Power]ment series, which has consisted of interviews with several working women of all ages in different stages of their career. These are women I not only find inspiring and interesting, but whom I think women of all ages should know about and learn from. These women hold careers in several different industries, from creative design to politics. They’re giving us an inside look into what their job is like, how they got there, sharing their advice for twenty-something’s, and touching on what Girl em[Power]ment means to them. This week’s profile is about a woman who inspired me to finish my series – the creator of The Empowerment Project. As I explained with last week’s influencer, I was able to go to a screening of The Empowerment Project, about a group of women who traveled across the US interviewing several different women about empowerment. I was able to speak with the creators of this amazing film after the event, and then they both said yes to being profiled! Introducing Sarah Moshman, documentary filmmaker. Q: What is your current job title, and can you explain your career path? A: I am a documentary filmmaker that is passionate about empowering women and girls through media! I grew up loving filmmaking and being behind the camera, I started making movies in middle school, then I went to film school and following that moved out to LA to pursue my dreams of working in TV and film professionally. I started out in reality TV, and worked as a field producer for shows on ABC, NBC, MTC, Lifetime, Bravo and The Food Network, but I missed telling stories that could really create impact. I made two short documentaries, [Girls Rock! Chicago, 2010 and Growing up Strong: Girls on the Run, 2012] then my first feature documentary was The Empowerment Project [watch trailer here] which is about inspirational women across the US and it has been screened all over the country and the world in schools, groups and organizations to start conversations about gender equality. Currently I’m directing my second feature doc called Losing Sight of Shore [watch trailer here] which follows the extraordinary journey of four women who set out to row the Pacific Ocean. I love telling stories about strong, inspirational women and I love my job. A: I went to the University of Miami in Coral Gables, FL and I majored in Video-Film and Psychology. Q: How do you deal with negativity towards women in the work place, if at all? A: I think as I’ve gotten older, I can better deal with moments of negativity in the workplace. When you’re first starting out, you are just happy to have the job and be able to pay your bills doing something you like doing. So often times there’s a fear of standing up for yourself and speaking out against discrimination or sexism. But when I would go home that evening, I would feel awful that I didn’t say anything and that I let it slide. It’s so important to let people know when they are making your work environment an unhealthy one, and to believe that if they knew they were upsetting you or someone else, they would hopefully stop that behavior. It’s tough, and every situation is different and every woman has to make that distinction when it comes up. We can all lead by example, and not take part in inappropriate behavior at work, and not allow those things to be done or said when we are the ones leading a team. Q: Who are some of your role models or mentors, and why? A: First and foremost my parents Diane and Harvey Moshman. My Dad is a filmmaker and TV producer as well so I have learned so much from him over the years about how to approach my career. He never made me feel like my gender would be an issue when working in this industry and that has empowered me in so many ways. My Mom worked as a chemical engineer and then switched careers to be a lawyer when I was a teenager. She always managed a great work-life balance and has been so encouraging to me. I also admire Geena Davis and the tireless work she does for the way women are represented in the media. I admire women who stand up for what’s right, take chances in their career and who aren’t afraid to fail. Q: Have you ever felt unsure of yourself or felt that you weren’t enough, and how did you overcome that? A: All the time! It’s very difficult to be a filmmaker because a lot of times you feel isolated and that the weight of your project rests on your shoulders. Some days are incredible, and some days you just want to hide under the covers and think about what it would be like to have a “normal job”. I struggle to appreciate the hard work I put in to something as it’s happening because I have so much work ahead of me. When I have those moments I think about the bigger picture. That my films are not about me, they are about other people. That my films are not about me, they are about the people I am trying to inspire. Take a break, take a breath, and keep pushing. You’ll get there. Q: What are other things you do [hobbies, projects, interests] that you feel passionate about? A: I host empowerment circles every month to get women together to support each other to thrive in our careers. It’s very powerful and fills up my soul every time. I also host an event twice a year called The F Word Event where amazing speakers and performers come together to celebrate and discuss feminism in many forms. It’s awesome. I love teaching, and meeting with other filmmakers to encourage them to go forward in their projects. I attend tons of networking events and panels about filmmakers and creators. I’m interested in empowering media in all forms. A: I love working out – going to spin class, yoga, pilates, bootcamp, etc. And just hanging with my husband Ryan and our dog Kuma. I’m a total homebody and my ideal evening would be cooking dinner and drinking wine with Ryan and watching Netflix. Q: What career and/or life advice would you give to your twenty year old self? A: I would say save as much money as you can, and don’t be worried about anyone else’s path. You are writing your own story, no one else can write it for you. Focus on what makes you feel alive, and pursue that passion with your whole heart. Q: What does Girl em[Power]ment and overall empowerment mean to you? A: Empowerment means being able to motivate and encourage yourself to go after any dream you can conceive of. Having the confidence and experience to know that it’s okay to fail, it’s okay to fall down as long as you get back up and keep going. Empowerment means not needing anyone else’s approval to make you feel whole. Find your own happiness and help others find theirs too. May we all feel that way in our lives and in our careers and lift each other up in the process. Stay tuned for next week’s influencer, and thanks for following along! I think it’s so incredible when a local group can bring together people for a message that needs to be heard nationwide-and this week I had the opportunity to go to one of these inspiring events. Carson Ronketto, one of the women I profiled for my Girl Em[Power]ent series invited me to this event called The Empowerment Project, put on by the Women’s Foundation of Arkansas and The Power of the Purse. The event was basically a screening of the documentary created by Sarah Moshman and Dana Cook, which was incredible. Sarah and Dana, along with their all women film crew traveled across the US for a month, interviewing 17 women in powerful and interesting roles, asking what they thought should be done about empowering women. It was so interesting to see how different each woman was, yet how they all wanted to achieve the same goal-to empower women and men. The event was really thought provoking also, as after the documentary screening, several women doing great things at the university were brought on stage for a discussion panel, as well as Sarah and Dana. It was so neat seeing the goal of the film play out in real life-as the creators wanted the documentary to start a conversation about empowerment, and really get the audience thinking. I especially loved this message-to have the film screened in large events, as opposed to sitting t home by yourself, so that a discussion could be had, and you would use your mind and think. After leaving the event, I felt so empowered-like I could literally take on the world. With my Girl Empowerment series, I was able to profile women of all different ages and in different careers, not only in the NWA area, but all over the US. It is so important for young women and all women alike to see ladies they can identify with and relate to, So many women growing up didn’t have women that looked like them, or talked like them-and now that there is more diversity, I think we should really be shining a light on this so that girls don’t get discouraged and give up. I think it’s essential to really talk to women in different careers with different goals and views, because that’s when you really discover that all women are reaching for the same goal no matter what-to be empowered and empower others, but also not bring others down. With that said, I am starting up my Girl Empowerment series again in a few weeks, finishing with a few women I think should be know, and that are doing great things. I hope you’ll keep following along! Over the next few months Flancake.co will be bringing you the Girl em[Power]ment series, which consists of interviews with several working women of all ages in different stages of their career. These are women I not only find inspiring and interesting, but who I think women of all ages should know about and learn from. These women hold careers in several different industries, from creative design to politics. They’ll give us an inside look into what their job is like, how they got there, share their advice for twenty-somethings, and touch on what Girl em[Power]ment means to them . I’ve been waiting to share today’s influencer for a long time now, as she was one of the original women who inspired the series. I first met Anna in person forever ago at a fashion event, but I had been following her and her blog for much longer. Our paths finally crossed when I decided that I wanted to somehow get involved in what she was doing with Lola last year. Fast forward – she has now been my lady boss for almost a year now [insert a happy eek here!] and I’ve learned SO much under her fabulous wings. She’s taught myself and the others around her what perseverance looks like – that it you want something you’ve got to not only hustle to get it, but also put forth a positive attitude and be kind to get it. Anna is always open to new ideas [even when I think she’ll think I’m cray-cray], and even if she’s not totally into, she’ll help you to make it bigger and better. She is always looking to uplift those around her, she is always teaching myself and the other Lola gals that although perfection isn’t real – being the absolute best you can is absolutely attainable. Oh, and along with all that she’s accomplished so much in her career, and is more than happy to share advice daily. Introducing Anna E. Cottrell, owner of Lola and Tulip Louise. Q: What is your current job title and can you please explain your career path? A: First off, hi flannery! Thank you so much for having me. My name is Anna and I am the owner of Lola. I always knew that I wanted to be in the fashion world from a very young age– it was just in my blood. I have vivid memories of when mom would take me ‘back to school shopping’ before the start of a new year and I would get home as quickly as I could with my new loot and a simple spiral notebook. From there, I would work to stretch my new clothes into as many different outfits as possible, try them on [down to the accessories], and jot down every detail of my final look. Once I wore it, I would mark it out in my little notebook. As it turns out this is eerily similar to what I do for personal styling appointments now! I digress. [Focus, Anna] Career path. I interned at Findings Showroom in New York for my college internship, which is when I first fell in love with the pace of the city– even though I was filing, faxing, getting coffee, wheeling massive trunks to the Javits Center for market, etc… I couldn’t have been more energized x this was when I paid my dues. First job out of college was with the e-commerce division at Neiman Marcus in Dallas, Texas. Having zero background in .com at the time, this was a major leap of faith [on both parts!] that I accepted as a learning experience and [quite frankly] for the chance to add a powerhouse of a company to my résumé. So small-minded. While the cubicle life didn’t turn out to be my jam, I learned endless lessons about workplace professionalism and company protocol within a corporate environment [i.e. e-mail etiquette, managing an editorial calendar, balancing workload, etc . ]. Honestly, just to be a fly on the wall and learn how the “big dogs” communicated was a major turning point for me , for instance the opportunity to sit in on calls with David Yurman about new products that needed to be uploaded by a certain holiday deadline . It was fun to be a point person between the buying office, graphic designers, copywriters, marketing department, and vendors– this opened my eyes to many different avenues within the fashion industry, and also the importance of everyone having a niche x working together for a bigger goal. Pretty cool now that I think about it. Hitting your first career stride out of college is kind of like having your first love– there’s nothing that can compare to the growth you experience, and you find yourself eternally grateful because it taught you so much about yourself. When I was in Dallas, I became even more interested in learning about the arts–spending weekends over wine + french film, gallery openings or the Nasher Sculpture Museum [still a favorite]. When I moved back home to Northwest Arkansas, it was to be the Web Director at a local boutique. Note: I said “Web Director” as if there was an existing site, but there wasn’t. However! This was an amazing opportunity to enter into a small business and try to make a big difference with an e-commerce site, by utilizing what I had learned at NM.COM— it was a fabulous time in my career. A couple of years later, I decided to turn what was then a hobby of blogging x styling, into my full-time gig… Enter: Tulip Louise. This was a life of hustle. It was creatively stimulating because I was shooting with talented photographers x makeup artists for the blog non-stop, getting endorsed / written up, started covering backstage at New York Fashion Week for Revlon every season + getting some publicity, rubbing shoulders with some of the greats, and then brands started sending me things to wear. Before I knew it, all of my shoots were subtly endorsing things that I hadn’t hand-selected for myself, which is when blogging began to lose it’s luster for me. I needed to take a break and press the reset button on it. Fast forward a couple of years, and I’m living back in New York as a freelance Art Director… but on the weekends shooting blog photos eating / endorsing a new Wendy’s frosty [huh?] — I guess it paid the rent, ladies. A: I studied fashion x marketing at the University of Arkansas. Q: How/or do you deal with negativity towards women in the work place? A: You know, Flannery, there was a time in my life when I would have had time to dwell or deal with negative people x thoughts, but I just don’t anymore. I was telling someone recently that something shifted when I turned 30– ha — unless someone [or something] is additive to my life x what happiness I’m working towards, it has to go. We only get so many days on this planet, and I have less and less tolerance for toxicity. I know it sounds harsh, but it truly just isn’t worth the energy– I’d rather spend that priceless time with people that I love, or working to build something great… instead of devoting energy to anything negative. It is a conscious effort I make every day. If you knew me a couple of years ago, you’d know this is a new lease on life for me! Q: Who are three of your role models or mentors, and why? A1: My mom, Jill. If you’ve ever met her, you’re lucky enough to know why she is a great role model. She is unbelievably kind x thoughtful x warm. Family and faith is everything to her, and I would be lucky to become half the woman she is. A2: Jeannette Balleza Collins. This woman is a powerhouse. She is so eloquent, as business savvy as they come, and has a pure heart of gold. Just an overall lovely human, that makes me want to be better. A3: Jade Terminella. She is the perfect no nonsense counterpart. A woman with a strong moral compass, get sh*t done work ethic, and gentle soul. Q: Have you ever felt unsure of yourself or felt that you weren’t “enough”? A: Oh, of course! Some days are harder than others, which is why we have to encourage women in our network. Life is hard… but really beautiful. A: Photography, art, travel. I used to be really into music — would like to get back to that. A: When I get the chance, I honestly live for a spa moment; manicure, pedicure, facial, or massage? Sign me up. Totally the way to my heart. A: 1- Always go the extra mile– it is so worth it. 2- Life can be very tricky, but keep your chin up– one day, all of those little twists x turns will make sense. I hope you thoroughly enjoyed Anna’s profile. She’s an incredible driven woman with such a drive for what she does! Hopefully we can all catch a bit of this spirit. Stay tuned for Sunday’s profile – you won’t want to miss it! Over the next few months Flancake.co will be bringing you the Girl em[Power]ment series, which consists of interviews with several working women of all ages in different stages of their career. These are women I not only find inspiring and interesting, but who I think women of all ages should know about and learn from. These women hold careers in several different industries, from creative design to politics. They’ll give us an inside look into what their job is like, how they got there, share their advice for twenty-somethings, and touch on what Girl em[Power]ment means to them. For this week’s influencer’s [Sun + Mon], I’ll be featuring lady doctors that both have their own establishments. These women have done incredible things and have accomplished so much, so I’m ecstatic to share them with you. Our next influencer is someone I’ve known for a while, as she’s one of my mother’s good childhood friends. When I first met Sabrina, the first thing I noticed was her awesome style and then how intelligent she was–which I really admired. She also is hilarious with dry humor that only some people get, but that’s the great thing about knowing her. Oh, and she was recently named one of the best plastic surgeons in America–I’m so excited for you all to learn about and hear from Sabrina. A: I have been a Plastic and Reconstructive surgeon since 2002. I own my solo practice which includes a full service facility. During my years in private practice, I developed and built a facility which houses my practice, full service medical spa, overnight stay hotel, certified and licensed surgery center. My career path started at a young age. I knew early that I wanted to become a doctor. I attended University of California, Berkeley receiving a bachelor’s degree in Bioresource Science. I then attended University of Arkansas Medical School, followed by 5 years of General Surgery training at University of Texas Health Science Center, San Antonio and 2 years of Plastic Surgery training at University of Miami. After all of this training, I opened my private practice in 2002 – It has been a busy whirlwind since. A: Negativity toward me specifically as a woman has been apparent during my schooling, training, and private practice. Women are still expected to maintain very traditional roles. These expectations are difficult to change in our modern society. Because many ambitious women balance family and career they are perceived as not serious about success. Because many women are accomplished without a family they are perceived as unusual. I handled negativity with the best attitude that I could. It is important to perceive negativity as the other person’s problem/issue not yours. You can’t let it affect you personally, have to learn to process it mentally and move forward. It is important for women to prove themselves with their intelligence, drive, and insight and not get caught up negativity. A: I think everyone has insecurities about themselves at times, but that is normal human nature. Successful women learn that life will have up and downs, successes and failures. We learn important lessons from all of these. It is important to maintain confidence in your talents and passion. Q: Who are your role models or mentors that you look up to? A: My mom and dad. A: I have had many interests and hobbies outside of work, it is important to maintain balance in your life. I love horseback riding. I have a passion for attending any sporting event, collecting artwork, and fashion. A: Exercise, watching sports, reading, studying fashion. A: Follow your heart and passion in life and work. If you don’t have a true passion for your career choice, it will be difficult to enjoy work on a daily basis. Enjoy every day to its fullest. Be confident. I am lucky to have found a career that is my passion. A: Girl em[Power]ment means that women and girls can achieve anything a man can. Women influence the world everyday and in countless ways. There you have it. I think it’s so important to remember that women and girls really can achieve anything a man can. Stay tuned for Wednesdays post, featuring another [awesome] lady Dr.
Our next influencer is someone I’ve been so honored to get to know through Lola, who really taught me several things not only about the creative world, but in life in general. Natalie Navis has had an unconventional career path, but never the less it’s so inspiring. She is one of the most giving humans I know, always putting others before herself [sometimes when she shouldn’t!]. She is also so positive, her contagious energy is like wildfire. When I started this series, she was on my list of women who really inspired it as a whole. I currently run my style blog and wardrobe styling business, which I’ve been working on in addition to my day jobs for four years now. I’m so excited to say that i’ve recently added freelance brand consultant to the mix! I’ve been assisting small businesses, particularly in the boutique beauty and retail industries, with brand development and an assortment of strategies that go along with that, including social media strategy and management, e-commerce development, creative direction of photoshoots, event production, merchandise planning, and more. It’s been so rewarding to help other girl bosses grow their businesses. My career path to this point has been anything but traditional! Prior to working in the fashion sales industry, I was an attorney. I attended law school right out of college, graduated, passed the bar exam, and worked for about four years as a research attorney for judges at the trial and appellate court levels. While the career was extremely rewarding intellectually, I felt that the introverted nature of my position did not fit my personality. I will always be grateful for my legal education and experience for giving me confidence in all business endeavors— and my strong backbone! When the judge I was working for during my fourth year retired, I knew the time was right to take a leap of faith into the fashion industry— something i’ve always wanted to do. I started working as a key holder/senior sales specialist for standard style [standardstyle.com] in Kansas City. I jumped in head-first, wore as many hats as possible, and learned so much during this first year. The company has had huge success growing their in-house line, Baldwin [baldwin.co], and it’s a privilege to say that I got my start there. Next, I moved to Lola [shoplola.com] in Fayetteville, Arkansas, to be the retail director and flagship manager. Again, I learned so much about the industry and about myself during this time, and I will always be grateful for the experience I gained and relationships I built. While living in Fayetteville, I became a certified Barre3 instructor [barre3.com], and that role remains extremely important to me. Although it was very difficult, I recently relocated back to my hometown so that I could embark on the next phase of my journey. My motto lately has been this quote: “every time I thought I was being rejected from something good, I was actually being redirected to something better.” It takes courage, but I believe that you have to let your path reveal itself to you— even if that means going through some transitional phases in life. A: I graduated from the University of Nebraska College of Law with my J.D. in 2009. Prior to that, I attended Creighton University and Graduated with my Bachelor of Arts degree in English in 2006. I was a total literature nerd in college— fitzgerald is still my favorite. Creighton is a liberal arts college and I was exposed to so many different paths while there, but when I graduated I was unsure about what I wanted to do. At my dad’s suggestion, I figured “why not go to law school?” I wouldn’t necessarily recommend the “why not?” attitude for everyone when it comes to law school. Generally, it’s a means to an end [practicing law]. But if you are a lover of learning, then law school is an incomparable education in how to think, read, write and communicate. While I’m not currently practicing law, I use my legal education daily in my approach to communication and all business matters that arise in life— and there are a lot! I feel more confident in my career because of my law degree, and that’s invaluable, particularly when you’re an entrepreneur. A: More often than “negativity” towards women in the work place, I see “inequality” towards women in the work place— and obviously inequality is a negative. I’m a believer that women have a long way to go in our society. The reality that we have never had a female president, that there are very few women CEO’s in Fortune 500 companies, and that females on business panels aren’t being asked the same questions as their male counterparts [see here— posted by flancake on facebook! ], makes it clear that we have not achieved equality. inequality towards women in the work place is highly dependent on the industry you work in. for example, I saw much more evidence of inequalities in the legal field [a male dominated profession] than in fashion [a female dominated profession], but that’s part of the problem. In the midwest, law is often seen as a more respectable, high-powered career than fashion, and therefore more suited to women— regardless of the huge amount of capital generated by the fashion and apparel industry in our country. I believe all industries should be gender neutral, and that women and men should be equals in any industry, from law to fashion. Unfortunately, I have dealt with a fair amount of comments from male superiors during my career that I qualify as sexist. My best advice? Stand up for yourself and call out those comments. Don’t ignore them or [ever] laugh. A: My babcia [“grandmother” in polish]: She’s a WWII labor camp survivor and immigrant to the US, and is still independent at age 90. She made a life for herself in america, learned to speak broken english, and raised three successful children while an uneducated, poor immigrant. Seeing life through her eyes gives immigration a whole new meaning to me. She exemplifies survival, independence, and determination. I know my strength comes from her— and probably my [sometimes] feisty nature too! My mom: she’s been an educator for 25 years at the college level. She believes in teaching her students how to think, not what to think. The other day, she was commenting that the test given by her department had been “dumbed down” to the point where it would be easy for the students to pass it, just so that the instructors could say they were successful in teaching. My mom wouldn’t give that test, or at the least wouldn’t let it count for much of her students’ grades. She won’t lower the bar for anyone and sees potential in everyone, no matter their race, gender, or background. She has taught me how to approach everyone I meet in life with the same level of respect and that we are all capable of so much more than we think. Megan hurley: owner of barre3 fayetteville and my former employer. This woman is a champion for all women [and men], has a heart of gold, and is the definition of “real.” She balances owning her successful business with being a full-time mom to two boys, and does it with such grace. no matter what, she makes the time for others. She has created the most nourishing community where all clients come to feel their best, physically and mentally. If you’re in the fayetteville area, you have to attend one of her life-changing classes. She is the one who asked me to become a Barre3 instructor [not once, but twice! ], had faith in me when i didn’t have it in myself, and mentored me as a grew. Because of her, I became invested in Barre3, a company that helps its clients lead a balanced life through fitness, nutrition, and mental wellbeing, while fighting for real beauty. You can see Barre3 founder Sadie Lincoln’s words on that topic here. A: All the time, every day at least once. I have battled depression and anxiety for much of my life, and while I’m sure I would experience feelings of uncertainty and inadequacy regardless, these feelings can be even more amplified and often. It does help to know that I’m not alone and that we all, as humans, feel uncertain of ourselves at times. My faith is a large part of me being able to get through times when my feelings of uncertainty and inadequacy are the most severe. My other grandmother, who passed away this past Spring, taught me about the importance of faith, and the peace that can be found in turning my worries, doubts, and fears over to God. I also have extremely supportive family members and friends who encourage me when I doubt myself. My ability to overcome feelings inadequacy is due in part to their unconditional love. The real relationships I’ve built throughout my life mean the world to me, and it’s these relationships that I come back to during times of self-doubt. That and turning off all social media for a while, because “comparison is the thief of joy” and we all need to remember that social media is a place where people create their perfect lives [probably not the best place to go when you’re feeling down about your own]. A: I have always been passionate about the arts. I grew up playing piano [and later teaching piano lessons at a local arts and music studio] and dancing [classical ballet and modern]. I was a member of a local modern dance company all the way up until moving to KC in 2013. Barre3 has been my substitute for dance since then, and I’ve become very passionate about a living a balanced life through fitness, nutrition, and mental health. It goes without saying that fashion is a major interest of mine— I guess obsession might be a more accurate term. For me, my love for fashion goes beyond an appreciation of it as the main form of creative self-expression. To me, fashion is empowerment. It’s dressing yourself in a way that makes you stand taller, walk more boldly, and take on life with confidence and enthusiasm. Fashion has so much transformative power, it just has to be harnessed. I also have a heart for a serious cause facing our society today: mental healthcare. My legal career opened my eyes to the gravity of this issue, and I’m committed to making a difference and working on behalf of this cause. One thing I think we can all do is be gentle with each other. This quote is so true: “be kind, for everyone you meet is fighting a hard battle”— and most of the time, you have no concept of how great that battle may be. A: How about you, miss flannery wilson?! You, my dear, are making a difference in women empowerment by creating this series! I am so inspired when I see young women in your generation who realize the significant platform that you have in being a blogger and woman in the fashion industry, and using this platform to work for a greater cause than self-advancement. Don’t get me wrong, i’m all for girl bosses advancing themselves and showing the world how powerful women can be, but when a woman uses that audience to advance a greater cause, that’s what’s truly inspiring. You’re a perfect example of a woman who has a heart for making a true difference for others. This women empowerment series demonstrates that you are going to do big things in this life that really matter, and I’m so excited to see your future unfold! A: Relax? What’s that? [just kidding.] I’m working on getting better at this. I love to go to barre, yoga, and dance classes, go for long walks outside [preferably with my family dog, but I’ll borrow pretty much anyone’s pup as long as he or she walks on a leash], read blogs, read books, and be a social butterfly. Ok fine…. and drink wine and watch netflix and eat nutella out of the jar [there, I said it]. A: Well, I have the benefit of having a brother who is 22 years old, so I give him the same advice that I would give myself at his age: it’s ok to have a plan for your life or a roadmap or a path that you think your life is going to take, but you have to recognize that life quite possibly won’t go according to that plan, and that’s going to be fine— you will survive. Don’t try to control everything or you’ll go insane. Embrace the journey and let life take it’s course. Even though it’s really hard, try not to let the detours or barriers dampen your spirit. Keep persevering on, and try to enjoy the moments along the way. Life really is a crazy ride. 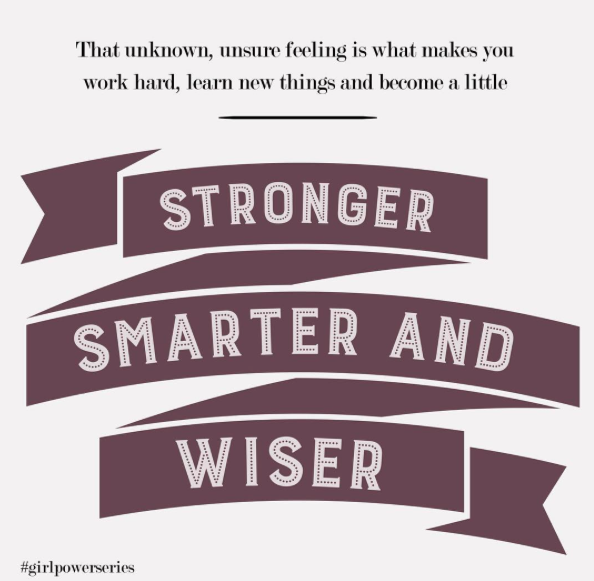 A: Girl em[Power]ment means both self-empowerment and helping to empower other women. While I love to read style blogs and I so admire the greats in the fashion industry, the women I truly respect are the ones who are making a difference for other women. I’ll be the first to admit that style and creativity are very admirable traits, but it’s ultimately what you do with those gifts that makes you great. Girl em[Power]ment is about using your talents, gifts, and skills to do something great for yourself AND for other women— working for a cause, standing for a marginalized population, bringing attention to a significant social issue, etc. I say, while you’re building that empire, why not empower other women along the way? Our next influencer is someone I’m so excited to share with you all, as she was one of the inspirations for the entire Girl em[Power]ment series!! I have known Kelly Stuckey for about four years now, when I first met her via instagram stalking and just HAD to get her to help my hair. She has a heart of gold, she is a giving soul like none I’ve ever seen, and her strong faith inspires those around her, myself included. Oh, and she’s a small business owner + wife + puppy mom, to all of which she excels tremendously. Those around her feel her radiance on a daily basis, which is why I’m so glad she is today’s influencer. A: My current title is Senior Hairstylist, makeup artist and co-owner of Crown Beauty Bar with my husband, Zac Stuckey. I am also a certified educator for Davines Hair Color and She by Socap Hair Extensions. My career path started at a young age of 14 working for my Dad’s photography studio and has taken so many turns from salon receptionist to Interior Designer to PepsiCo modular planner to CitiScapes advertising sales to restaurant hostess while attending beauty school and now a small business owner. It’s incredible and encouraging to see the way it has all come together in my life, and how each step paved the way for the next. Every place I worked I met people who played into my next role and even met my husband along the way! A: I first attended the University of Arkansas Fort Smith and received an Associates of Art. Then I transferred to the University of Arkansas and graduated with a Bachelors of Interior Design. Three years later I attended Paul Mitchell The School Arkansas for my Cosmetology License. A: Thankfully I work in a female dominant environment where we get along and lift each other up! The most negativity I ever deal with is when a client doesn’t like things about their own hair and or looks. I love enhancing each woman’s individual beauty and teaching them ways to carry that home. I want to shatter any negative images they have about themselves. A: My first impactful role model is my Mother, Karen. She was and still is always there for me. I know stories of how she worked hard and did what she could to provide and take care of me after my parents split at a young age. She always made me feel beautiful and supported especially during times when I struggled with my weight, career, or life choices. I’ve also been blessed with a Spiritual mentor, Kristen Davis, pastor at Life Connection Church in Rogers, AR. She came along at the perfect time in my life, helped me see the power of Jesus’ love and grace, and was instrumental in helping me learn more about how to study the Bible. I would say my biggest mentor is my husband, Zac. He is a strong, steady constant in my life and has a true servant heart. He pushes me to be better and is always incredibly supportive. It’s incredibly cheesy to say, but he does make me feel like anything is possible so long as we do it together; he gives me wings! I love owning a business with him, doing life, and can’t wait to become a parent with him next April!!! A: Oh yes, a lot when I was younger. In fact, I still struggle with this insecurity from time to time. I didn’t know my true identity until I really let God into my life and got serious about pursuing a relationship with Jesus at age 28. Anytime I allow the lies of this world to fill my mind, I stumble into insecurity. I remind myself the truth is I was made by God and for his purposes… before I understood that, nothing made sense. Now I read and reflect on what his Word says about me for affirmation on who I am. A: It’s amazing to live in a community with so many female small business owners and creatives in my local community! Here’s a few businesses to check out: Kirsten Blowers owner of Riffraff, Amy Hannon of EunaMae’s, Valere Gregory of Valere Rene Handbags, Becca Brisiel of Maude Boutique, Chelsea Hermez of Pigmint. Another woman shaking things up in California is Shanna Noel, creator of Illustrated Faith, helping creative women express themselves and learn more about God’s Word through a journaling bible. A: Walk my dogs, jeep rides with my husband, read, doodle in my journaling bible, zone out on social media. A: Be patient, work hard, do not expect anything, and be thankful for every opportunity to learn. We all graduate and think “okay, I made it.. now where is my awesome job and salary?” It’s just not that easy all the time! I truly believe in hard, honest work and being a self-starter. The other thing is: your 20’s are just awkward! I had so much fun in my 20’s, but so much confusing unknown too. It’s not that I have it all figured out in my 30’s now, but I am more secure in myself and truly trust God has plans for me. A: Girl em[Power]ment means looking past the stereotypes created by the world and other people to see who I am and what God created me to be. I have been given gifts and talents to use to help others and it’s up to me to make that happen with every opportunity that I am presented with! I love working in an industry where I can make women feel beautiful and teach them tricks they can use at home to create their look on a daily basis. I also want to empower my employees to be self-starters, find the lesson in every situation, and take ownership of the career and life they have a heart for. You can’t sit and wait for everything to fall into your lap. You gotta hustle while keeping your eyes and ears open. Stay tuned for next week’s influencer–these ladies just keep rocking it! Our next influencer is Nina Copeland, who I’ve gotten to know over the years at Johnson Dermatology. She not only gives great skin advice and has a must-read blog, but is a working mom who’s also got killer style. Nina always has a positive energy about her, and never fails to make me feel at home when visiting her. Keep reading for her [amazing] answers and advice for twenty-somethings. A: I’m a dermatology nurse practitioner at Johnson Dermatology. I do surgical, cosmetic and general dermatology. I started as a certified nursing assistant at age 16. I worked in hospitals eventually becoming an RN and then a Nurse Practitioner. I have experience in OB/GYN, outpatient surgery, forensic nursing, ICU and the ER. Finally, I’m at my home in dermatology. A: I went to the U of A in Fayetteville where I recieved my Bachelors in the Science of Nursing. I attended UCA in Conway where I earned my Master in the Science of Nursing. I am certified through the American Academy of Nurse Practitioners as a Family Nurse Practitioner. A: Everytime I try something new! It’s life and that unknown, unsure feeling is what makes you work hard, learn new things and become a little stronger, smarter and wiser. I definetely use that insecure feeling as fuel. A: My first female role model is my Mom. She came from nothing, put herself through college and became an electrical engineer. She has worked for Texas Instruments, NASA, mulitple colleges and now is a teacher. She worked while my Dad stayed home raising us, now that’s a boss lady! Second is my collaborating physician Dr. Sandy Johnson, she always has a positive attitude. She is my constant reminder of how to be better all around. She is a business woman, a doctor, a wife, a mom and happy. Lastly, Brittney Spears, because if she can get through 2007 I feel I can do the impossible no matter how bad a hair day I have (only sort of kidding, kind of serious). A: I have a 5 month old and a 2 year old so right now my passions include potty training and breastfeeding. My interest include getting a shower and my teeth brushed before going to work. And sleep is a real project. Although, I do remember a time when traveling, volunteer work, road biking, barre, wine with friends and running with my husband were all on my favorite to-do list. A: I think women empowerment is really blossoming in Fort Smith. Look around at all the local women starting their own businesses. Hazels Haven, Suite One, Indie, Roots Salon, Belle Starr Antiques, Baby Chic and Kens & Co. are just a few of my favorite Fort Smith girls that own their successful businesses. Know who your local women business leaders are and support them, that’s what women empowerment is all about! A: I love the lake, the pool and massages. I like to meditate. If I get a break I like to just sit outside and think while sipping a cup of vanilla chai tea latte. A: Your actions will follow you and have consequences. Make decisions based on the consequences. Think about where a job will take you not just what that job is. Your twenties are just the beginning and even though it feels like it takes “forever” to get through college or move up in a position or get married or whatever I promise it is just a very brief moment in your life. Time keeps getting shorter and days will seem like hours before you know it! A: Owning it. By that I mean be confident and own your brand, what you represent. Be humble. Share what you are good at with other women and encourage them to be amazing too. If we support each other the sky is the limit. Have you heard the saying the woman is the neck that turns the head in a family? The truth is women are the brain! We can turn the head and shake the hips simultaneously, heck we run it all! Stay tuned for Wednesday’s influencer, and I hope you enjoyed hearing from Nina!